How much sugar is in one can of soda? Ever bother to look at the back of a soda can? Maybe you've seen that a regular can of soda — 12 ounces — has about 150 calories. And that's where most people stop reading. There's no fat, and hardly any sodium. Nothing to see here. But there is some sugar. 40 grams. Ok. 40 grams. That's not a really big number. Some people just like sweet drinks. There's people who order a small coffee — McDonalds serves a 12 ounce small coffee — and they put 5 or 6 sugar packets in it. Maybe they use sugar cubes instead -- one sugar cube is the same as a packet.. So how much sugar is in a packet, or cube? Not every sugar packet is the same size, but almost all of the sugar packets you'll see in the United States contain about 4 grams of sugar. And those 4 grams of sugar have 15 calories. Since there's 15 calories in a packet or cube of sugar, and each is 4 grams, that means the 40 grams of sugar equals 10 packets of sugar in a can of soda. And at 15 calories per packet, that means that all 150 calories are from the sugar. Can you imagine eating 10 packets of sugar and then drinking a glass of water? 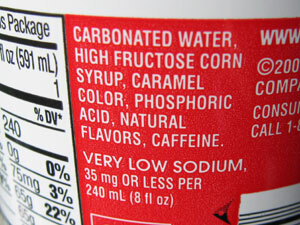 "But I buy bottled soda"
So how much sugar is in a bottle of soda? Well, most bottles of soda are 20 ounces. 20 ounces has 69 grams, divide by 4, and it means there's 17-and-one-quarter sugar packets in a 20 oz soda bottle. A medium soda cup from McDonalds holds 21 ounces. Well, for one thing: if you're at risk for diabetes, lots of sugar doesn't help you at all. You probably know that when the body digests sugar, your pancreas releases insulin to help you use the sugar energy. Too much sugar, and you can wear out your pancreas. Not to mention that sugar makes you fat. How fat? Well, let's pretend that you consume the exact number of calories needed to power your body, every single day, and no more. That's a pretty good diet. Now, to reward yourself, you enjoy a soda every day. Just one, you don't want to go overboard. That one soda per day adds 150 calories every day. 150 calories * 365 days equals 54,750 calories each year. Since there's 3500 calories per pound, that one soda per day adds 15.64 pounds per year. If you weren't already fat, you will be soon.